This document will run you through how the Behaviour Module appears in your Seating Planner and also how to use it. 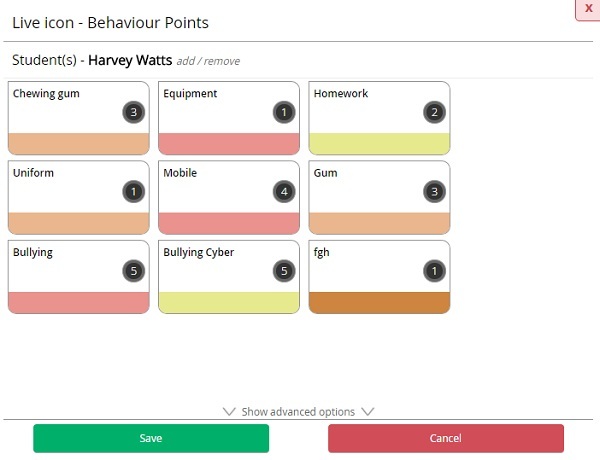 When you log into MINTclass and your school has opted into the new Behaviour Module you will see new icons (you may need to ask your MINTclass Administrator about these). For the purpose of this document see the student card below. The two new icons are the Green and Red ones with the numbers underlined. 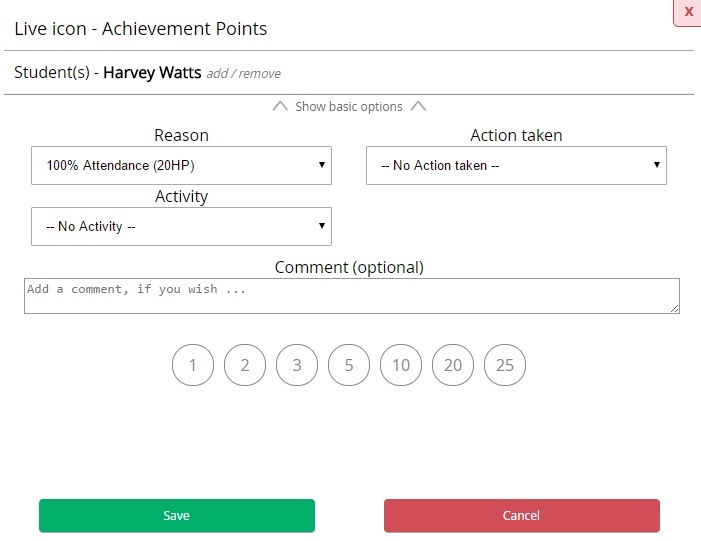 We will look at adding Quick Points for an achievement first. Click on an achievement button (in this case the green one). You can now see that your MINTclass Administrator has set up some quick points for you. This means that you can add reasons with one click by simply hovering over the reason that you wish to add and click on No Comment. If you wish to add a comment click on Comment. Simply type the comment you wish to add and then click on Save. Another option you have is to add more detail to the event. Say you needed to add which Action you had taken or where the event took place (this will be in line with your school's behaviour policy). When you hover on a quick points you will see a cog. Click on this. You may now select the Action taken etc from the pre-populated drop down boxes. Click on Save. If you wish to add a reason that is not on the quick points list, click on Show Advanced Options. You can now choose from the list of Reasons and add any other required information. Select a reason, if necessary select the number of points (your MINTclass administrator may have locked this section down). 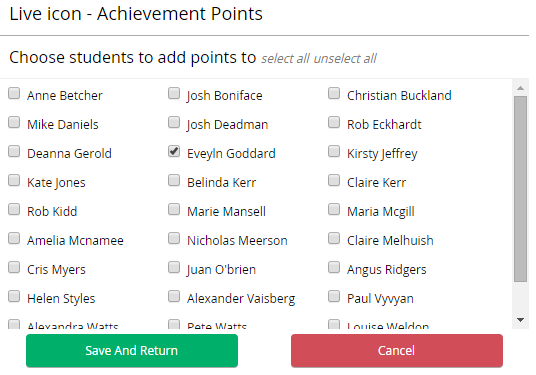 You can add Behaviour points in the same way but you will need to click on the red icon to do this instead of the green one. 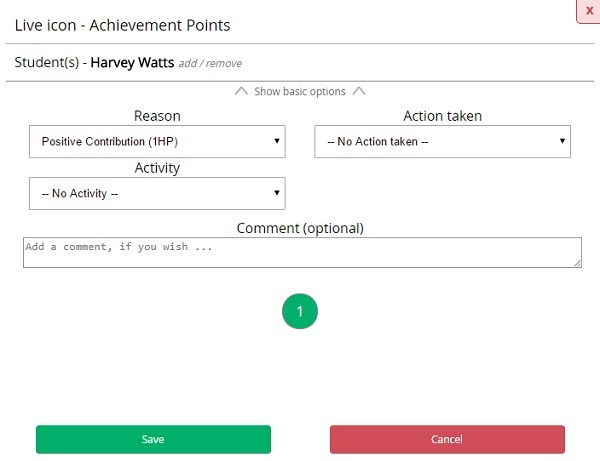 When you click on the behaviour icon, you will see a different set of Quick Points and a different set of Reasons in the Show Advanced Options area. You can add reasons to more than one student or to an entire group of students at the same time. 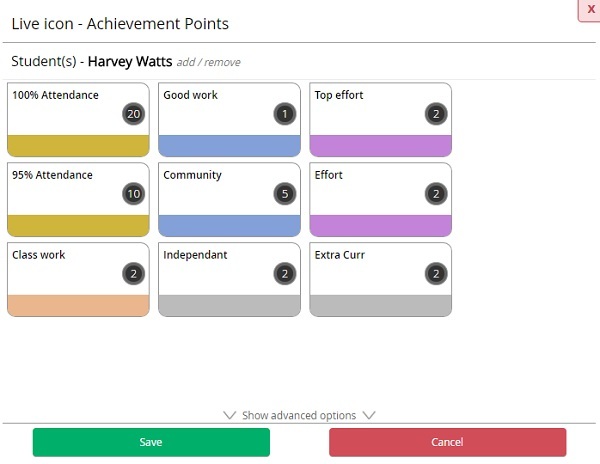 Click on the appropriate icon to add behaviour or achievement for one of the students that you wish to add a reason to. Now to the right of the student name, you will see an Add/Remove button. Click on the Add/Remove button. You will now see all the students in the current class/group/search. Select the students you need or to select all student's, click on the select all button at the top of the pop-up. Now select the reason that you wish to add. Remember you can choose one from the Show Advanced Options area if you need to.